All Year, 7 days a week [closed 25th Dec.to 1st Jan.] : 10am - 6pm [5.30pm winter] Last entrance to Garden 5pm. Group Rate [10 minimum] £3.50 per person. Please book in advance. We cannot provide parking space in our car park in June, July & August, however groups are still welcome. Please note - some foreign style coaches are unable to cross the village bridge some 20 metres from our entrance & usually park on the road in the village. British models have no problem gaining access to our car park where there is ample space outside of peak summertime. None on the premises however a public convenience block is situated approx. 20 metres from entrance. Wheelchair access was an important consideration in our design ensuring access to most of the garden and nurseries (95%+). A variety of seats within the garden allow for frequent rest stops. Some gravel paths. The Japanese Teahouse represents the Cha-Seki wherein the Zen Buddhist Tea Ceremony is performed in Japan, and does not serve refreshments. 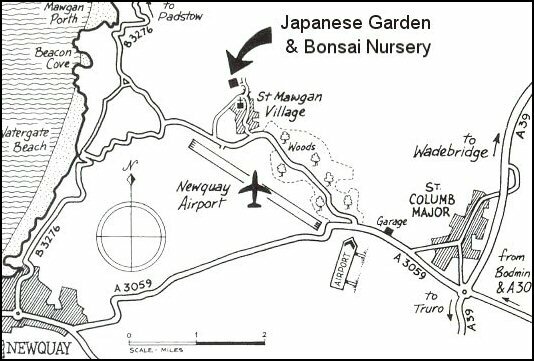 Refreshments available at St.Mawgan Village Tea-room, contact Jenny Salmon 01637 860303, or visit The Falcon Inn in the centre of the village, which also has a large outdoor garden area.